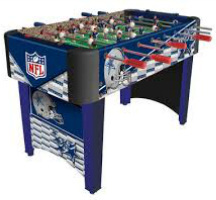 Looking for a foosball table that will match the football theme in your game room or man cave? Maybe you are just looking for a gift for that football enthusiast you know? The NFL table comes with your favorite team's logo and graphics pattern around the cabinet, grips, and even the men on the playfield. You will love having a piece that really stands out from traditional wood grain tables. 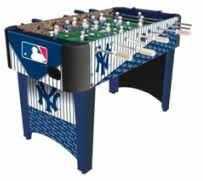 If you happen to be a bigger fan of baseball, you might want to check out the MLB foosball table offered by Imperial also.